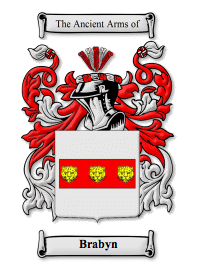 Following on from my last post about the Brabyn family tree, I've found out about HouseofNames.com, which provides some interesting background to the family - and a colourful version of the coat of arms shown here. This history is a a little different from my understanding (which is that the first Brabyns recorded in the UK were former Flemish mercenaries who settled as pirates in Cornwall in the 15th Century). So are we pre-Norman Conquest pillars of Lancashire society, or more recently reformed mercenaries, pirates and wreckers?